#MexicanMonday should definitely be a thing, I know I am hugely biased as I LOVE Mexican cuisine, but you have to admit it does have a delicious ring to it! This dish was just something I put together with what was available in the fridge, isn’t that how all the best dishes start? When I posted a photo on my instagram and facebook it went down really well and I’ve had many requests to write up the recipe. Its low carb, full of goodness and above all super SUPER tasty! So here we are…feast your eyes below…. – Add the quinoa, two cups of water and cumin into a pan. Bring to the boil and simmer for 15mins. The quinoa will soak up the cumin flavoured water. Take off the heat and pop aside. -Mash the avocado with a little salt, pepper and lime juice. Pop aside. – Coat the chicken breasts in the fajita spice. – Melt the coconut oil in a large flat frying pan and lay in the chicken breasts. Listen to the sizzle!. Let the chicken cook over a medium heat for 6 mins one side and then turn over for another 6 mins on the other side. – In the same pan you cooked the chicken in, add the onion and peppers. Do NOT clean the pan before adding them because you want the onions to soak up all that super tasty flavourness ( from the pan. Once they are softened squeeze the juice of half a lime in and stirr in the quinoa. Mexican quinoa….done! 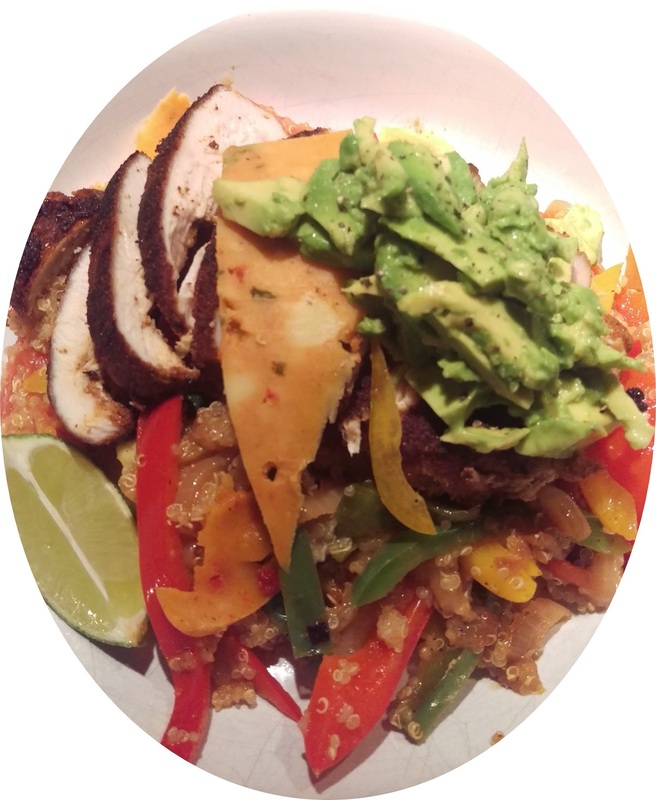 – To serve, spoon the mexican quinoa mix on a plate, top with the spicy chicken and then top that baby with the mashed avocado with a wedge of lime on the side. I chose to add a little slice of Mexicana Cheese which is my ultimate indulgence at the minute. and last but not least…EAT! feast and enjoy with your family or friends!